Grape hyacinths (Muscari) look much like little miniature hyacinths. These plants are smaller and only get about 6 to 8 inches high. Each grape hyacinth flower looks like it has little beads all strung together up and down the stem of the plant. Plant the bulbs in groups of ten or more, and be sure to set the bulbs twice as deep as they’re tall, and at least a couple of inches apart. 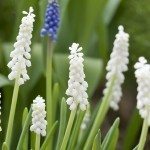 If you are wondering, “Do I prune grape hyacinths?” the answer is that you don’t have to. The plant will be fine if you do not. But if you want to neaten them up a little, a trim will not hurt the plant either.